^ a b Nájar, Alberto (October 7, 2015). "¿Por qué la película "Sicario" enoja tanto a Ciudad Juárez?" (in Spanish). BBC. BBC Mundo. Archived from the original on November 14, 2015. Retrieved 23 May 2016. ^ "Sicario DVD Release Date January 5, 2016". DVDs Release Dates. Retrieved 2018-06-18. ^ "Sicario (2015)". Rotten Tomatoes. Retrieved February 24, 2019. ^ Bradshaw, Peter. 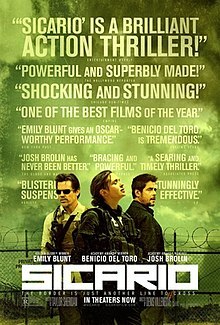 "Sicario review – Emily Blunt at the sharp end in war on drugs". The Guardian. UK. Retrieved 2015-10-30.